The word "meatloaf" doesn't exude too much excitement. It is one of those meals that has been a staple on the tables of mothers, housewives, and grandmothers for years. Most of the time it is just an over sized, glorified hamburger patty. Like Randy famously said in A Christmas Story- "Meatloaf, smeatloaf, double-beatloaf. I hate meatloaf." I actually only made half of this recipe. I was pretty sure that my husband and I would be unable to eat an entire 2 lb meatloaf in a few days. ;) And even though the recipe called to just finely chop the veggies in the food processor and NOT puree them, I did puree them. Great trick for mothers (or wives) of children (or husbands, not naming any names here...) that hate vegetables. 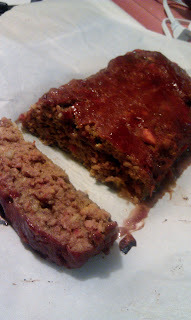 Plus, I think the pureed veggies made the meatloaf just that much more moist. The Good Eats Meatloaf was tasty. The husband loved it (didn't even notice the hidden vegetables! Shhhhh...) and I actually really enjoyed it. I didn't even need extra ketchup squirted on top and served on the side for dipping- a first for me when it comes to meatloaf.